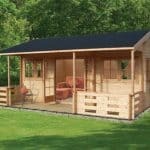 With so many makes and models to choose from, it can be a nightmare finding the perfect log cabin for your garden. Here at WhatShed, we’re all too aware of this. Today, in an effort to help steer you to the cabin of your dreams, we’ll be putting The Rho range of log cabins by TigerSheds under the microscope. For those in the market for simple, yet extremely hardwearing, compact cabin, The Rho might just be perfect. Thanks to its pent roof design, The Rho takes up no more space than is strictly necessary whilst remaining comfortable inside. We were hugely impressed with its overall construction, the quality of the materials used, and the attention paid to small decorative details. We were fortunate enough to spend some time inspecting The Rho at TigerSheds’s salesroom in Leeds recently. The model we viewed was the largest of the range, the 14’x10’ offering, finished with European double glazing. We particularly enjoying being allowed to explore the cabin without pressure from a sales representative. This meant we could really scrutinise the product, something not possible with every garden building manufacturer. Anyway, with introductions and first impressions out of the way, let’s begin. Compact model – great for smaller gardens. Perhaps not a grandiose in appearance as other models. 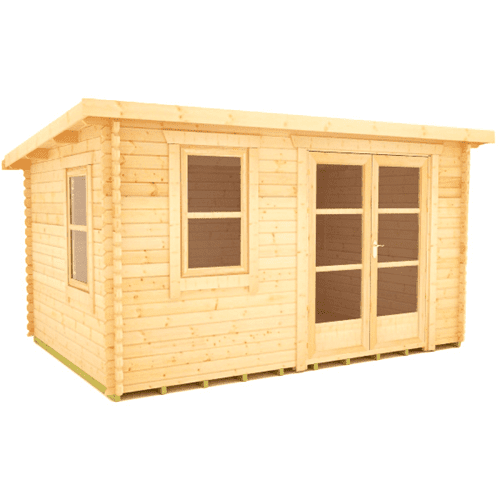 The Rho range of log cabins comprises of six different sized garden buildings. Details of the dimensions can be found in the table below. In addition to this range of sizes, TigerSheds also offers custom dimensions at an extra cost. One thing that really stood out about the TigerSheds service was the fact that the company will reduce the height of any log cabin so that it abides by local planning regulations. Since The Rho stands at a maximum height of 2328mm, it will not need planning permission (as is required on buildings over 2.5m when positioned less than 2m from a house). 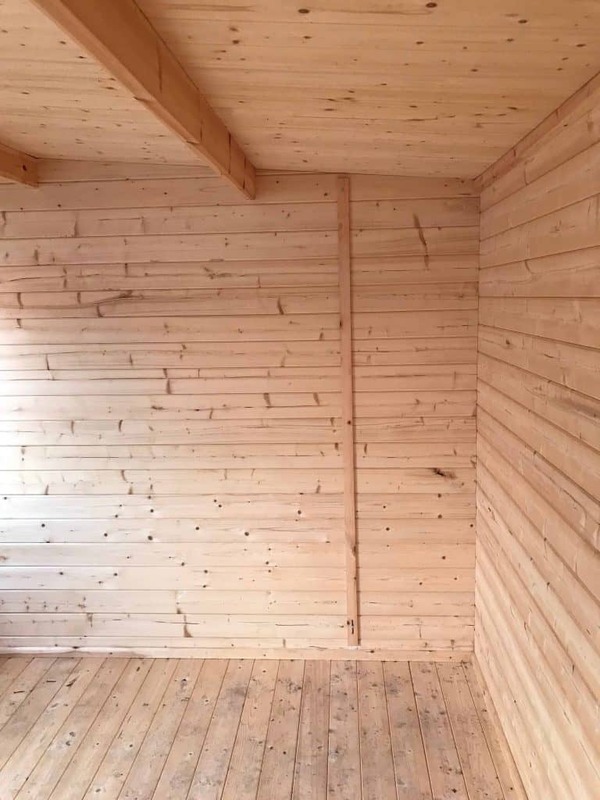 Many other log cabins (both by TigerSheds and other manufacturers) are taller than the permitted height and whilst TigerSheds will reduce the height, this can make the ceiling uncomfortably low with apex roof designs. This is not the case with The Rho and it therefore would be a strong choice for those with a smaller garden. Like its entire range of 44mm cabins, The Rho by TigerSheds is constructed using slow-growing European redwood. Whilst this is certainly not the cheapest possible timber for the job, the manufacturer has clearly aimed to build a cabin that will stand the test of time. We liked that TigerSheds proudly announces its decision to use slow-growing European redwood too. Many manufacturers omit details like this, and we can only infer from such an omission that the quality of the wood used is not something they wish to boast about! Cheaper, inferior woods, such as Baltic white wood, is often used by manufacturers to increase their profit margins on each building. This much faster growing material is certainly less expensive but is much more prone to warping or splitting than that used in the construction of The Rho range. Another strong plus for The Rho is the fact that all the timber used in its construction is milled at TigerSheds’s own facility in Yorkshire. This means that every shed is cut to order, and materials aren’t stored in potentially suboptimal conditions when waiting to be bought. 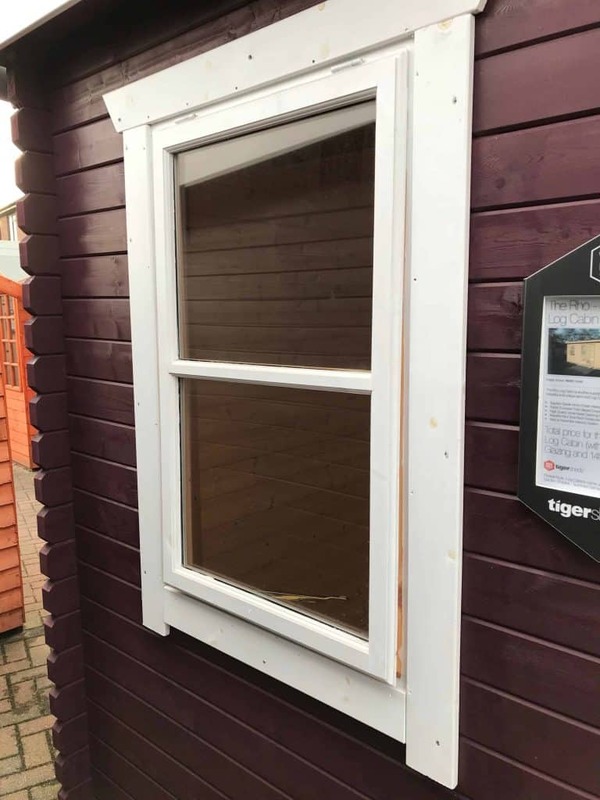 Therefore the risk of imperfections in your finished cabin is substantially reduced and any that have slipped through TigerSheds’s quality control are easily rectified. The Rho range of garden cabins is delivered untreated. The manufacturer states that it is best to coat the wood with a spirt-based treatment within 14 days of erection. For this, TigerSheds offers two different products. The company’s own is called TigerCare and is available in three natural colours. 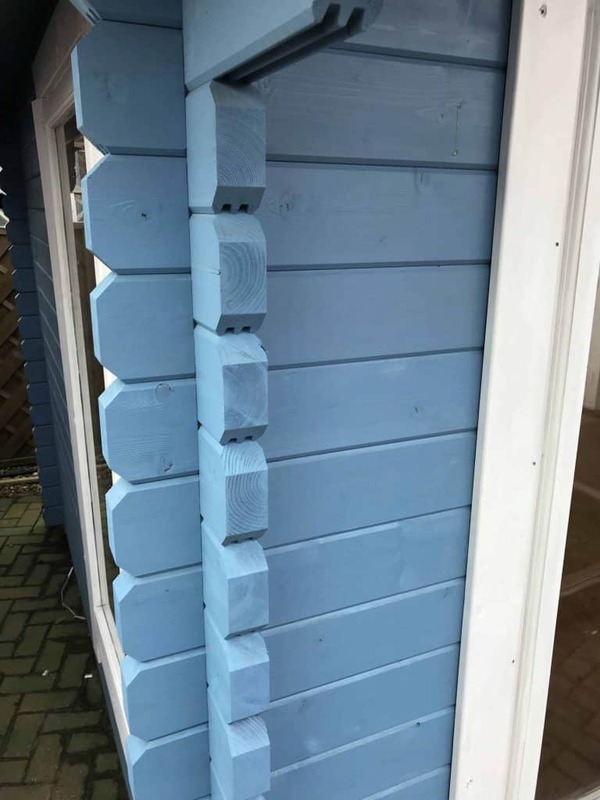 Meanwhile, TigerSheds also stocks Cuprinol that will not only protect your new garden building but also give it a more striking look since it comes in a total of six slightly more exotic colours. We seriously rate TigerSheds’s decision to go with 44mm walls as standard. Rather than cut corners, the company once again displays its commitment to providing solid, long-lasting garden buildings here. The timbers comprising The Rho are assembled using a four-way notch system. This results in an incredibly robust product that provides exceptional warmth, longevity, and security. Complementing this sturdy and weather-resistant basic construction is the cabin’s cladding. Connected using tongue and groove joints, such a finish makes The Rho much less likely to be penetrated by the elements than competitors opting for cheaper construction methods. Whilst visiting the Leeds showroom, we tried our best to give The Rho a wobble, but the thing just wouldn’t budge! As you can see from the picture below, the walls are not only sturdy but beautifully finished on the outside. Each timber has been notched on all edges. This gives the cabin a bespoke finish and it is such attention to detail that makes TigerSheds stand out as a quality manufacturer. Some manufacturers have been known to supply log cabins with much thinner walls. This might save both the customer and company a bit of cash in the short-term but since it is the longevity of the building that suffers, it is ultimately the customer that loses out from such cost-saving choices. Another feature of The Rho range we rated was the inclusion of storm braces –additional supports that bind the structure even tighter during high winds. Many manufacturers would have failed to include such a handy and potential-cabin-saving additional. Evidently, TigerSheds wanted to give its customers the best possible shot at enjoying their garden building for as many years as possible. The Rho’s roof is a classic pent shape (single sloping roof). 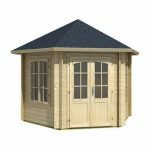 This might not have the same “wow-factor” as the likes of The Shere and The Delta 44mm log cabins (both TigerSheds products) but for certain customers, the lower roof will be ideal. Since planning regulations demand that all buildings less than 2m from a house must be under 2.5m tall, the lofty Shere log cabin would need reducing in height by over 30cm to make it compliant. TigerSheds will provide that service for free but the problem is that the walls must also be reduced by the same amount. This results in a much smaller-feeling cabin than the standard Shere we viewed in Leeds. However, this is not the case with The Rho range. The pent roof, standing at just 2328mm will not require planning permission no matter how close it is positioned to your house. In terms of its actual construction, the roof uses 19mm tongue and groove boards with recessed pearlings. This perfect, gapless finish makes unsightly drafts highly unlikely. Supporting these boards are sturdy 44mm by 122mm timbers which, like other elements of The Rho range, will surely add to its longevity. As standard, The Rho range comes with heavy-duty mineral felt as a roof covering. This is good to see from TigerSheds. Some garden buildings are sold with no roof covering whatsoever for the listed price. They can either be added at a cost with the alternative being to let mother nature do her worst on your new, expensive exposed woodwork. Fortunately, this is not the case with The Rho. The default mineral felt option will provide more than enough protection from the elements. However, it can be upgraded to shingles at a cost. The singles come in a range of four colours and have been battle-tested in Snowdonia (they’re the same as those used on a Youth Hostel in the Welsh mountain range). Another aspect of The Rho range that impressed us was its floor. Like the walls, there’s very little give in it. This, again, is down to the choice of materials TigerSheds have used. The 19mm, tongue and groove floor sits atop a hefty 58mm x 44mm tantalised frame that has been pressure treated for extra rigidity. We believe that the floor offered was study enough to take the kind of everyday abuse a family might throw out it. However, TigerSheds do offer upgrades to its thickness for this wishing to use The Rho as a workspace. Further customisation can also be achieved with the use of decking. Two sizes are offered at an additional cost – 8’ and 12’. Although certainly contributing to the premium price point of The Rho when compared to similar cabins, we liked that the standard floor was so well made. We’ve seen many examples of 11mm floors in similar buildings that just don’t have the same sturdy feel. Top marks again, TigerSheds! All Rho cabins come with draft-sealed, single-glazed glass throughout. This standard offering is 3mm. Each of the two windows open fully and the sizeable double doors make access easy. All the glass on The Rho can be upgraded for an additional fee. Both toughened glass (4mm) and double-glazed (two 4mm panes with a 6mm gap) are available. Whilst these do provide heat retention and security perks, the standard glass will make your cabin more than habitable in all but the coldest months. We particularly liked the attention to detail on the window and door frames. Each is tastefully finished with architraves, both inside and out. The obviously-joiner-crafted fittings provide another example of TigerSheds refusing to compromise on quality where perhaps some of their peers may. About style, windows and doors on The Rho range can be upgraded to either Georgian Style, full-pane toughened, or PVC. These can certainly help add character to your cabin but do, of course, carry an additional cost. In terms of security, TigerSheds have not gone for the cheap option favoured by some competitors. Doors are fitted with mortice locks as well as top and bottom bolt locks as standard. For additional peace of mind, however, there are also host of upgrades that can be added. These include a sturdy five-lever lock and a choice of alarm systems. As part of the listed price, TigerSheds offer to deliver your shed personally using a crane. This is certainly a welcome addition to the service. Although many of TigerSheds’s competitors will offer delivery as standard, we often find that this involves hand uploading, during which pieces can become damaged. Also problematic is when a manufacturer claims to provide a delivery service, but the actual job is performed by a third-party company. If a delivery company were to damage a piece, the process of complaining/having said piece replaced could prove to be much trickier than with TigerSheds. 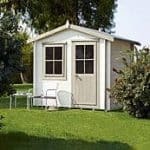 Thankfully, since TigerSheds offers delivery using their own staff and equipment, you are much more likely to receive your garden building damage-free from the off. At the best part of £800 at the time of writing, the installation certainly isn’t cheap. 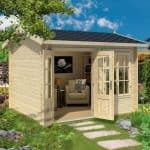 However, for those less competent at DIY, the elderly or infirm, or those who are simply too busy, the peace of mind secured by having a trained professional who is experienced with the assembly of such products is worth well it – particularly given that all liability for damages occurring during both delivery and installation will be with TigerSheds. All told, The Rho range of log cabins from TigerSheds is a beautifully constructed set of cabins by a quality manufacturer. Although certainly not the cheapest offering on the market, the attention to detail, quality materials used, and almost limitless customisation options make this collection an absolute winner in our book. There was little to dislike about The Rho cabins in terms of their construction. Our inspection of the salesroom in Leeds allowed us to fully explore the range, inside and out. We were suitably impressed by the craftsmanship that has gone into each and the fact that timbers were cut to order in TigerSheds’s own mill inspires great confidence in the quality of these buildings. Those seeking a sterling quality, space-saving cabin with all the finishing touches of a more grandiose garden structure can do much worse than The Rho. We strongly recommend! This is high quality all the way through with no corners cut anywhere.